From Pro Se Productions’ Sovereign City roars yet another Hero, this time debuting as a top quality audiobook produced by Radio Archives! 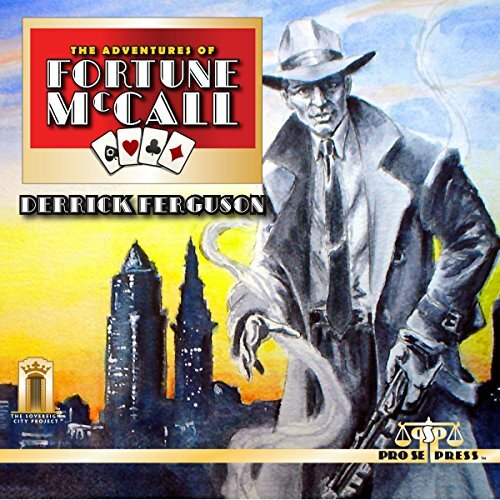 Derrick Ferguson's THE ADVENTURES OF FORTUNE MCCALL brings a seafaring gambling ship owner and adventurer to the shores of Sovereign and flings him and his circle of companions feet first into Murder, Mystery, and Madness! Four stories of Fortune and his team are featured here, all penned by Ferguson, the man behind Fortune McCall! Heroes to spare, villains to fight, and a city to save. These are THE ADVENTURES OF FORTUNE MCCALL! This two fisted New Pulp audio book is also available on Audible and Itunes. THE ADVENTURES OF FORTUNE MCCALL is available in print and digital formats at Amazon and www.prose-press.com.